You may have seen signs such as the one pictured on the Clapham Common cycle route suggesting that you cycle with consideration for pedestrians, with a quoted speed limit of 8 mph. Some people have questioned the legality and enforceability of such a stipulation and see it as putting an unfair burden on cyclists. Whilst this may be true, it is also a pragmatic approach by the council to address the concerns of some Common users about the speeds of a minority of cyclists. The council has been under pressure to address complaints, and rather than an outright ban (which some people would push for), measures to encourage considerate use is by far a better outcome, and at least acknowledges that cyclists have a right to use the common. pedestrians so please cycle considerately across the Common. The Art Deco style, which swept through Europe in the '20s and '30s, brought the streamlined glamour of Cadillac cars and Cunard liners to the design of everything from town halls to teapots, forming an elegant bridge between the Classicism of the early 1900s and the Modernism of the mid-century. 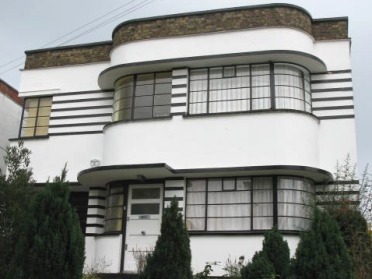 In London it is above all the style of the suburbs, whose characteristic building types - cinemas, tube stations, factories and roadhouses - became the classic expressions of the architectural new wave. Our thanks goes to Hannah Parham and David Garrard of English Heritage for leading another superb ride. At our November meeting we heard from the Coordinator of the newly launched Lambeth Living Streets and discussed ways in which we can work together to promote the mutual interests of cyclists and pedestrians. A relatively short, leisurely ride looking at the marketplaces and squares of north London plus a few bonus buildings. We'll see the surprising variety of hidden Victorian squares in Islington and Hackney ranging from the Gothic style of Carpenter to the classic lines of Roumieu and Gough as well as Isingtonian 'period' developments by Leroux and others that have been favoured as residences by politicians and writers alike. The ride incorporates popular north London markets including Smithfield, Spitalfields and Brick Lane (only a couple are active on a Saturday). Additional north London curiosities will include London's only building by Liebskind and residential housing by Piers Gough. There will be an opportunity to visit one of oldest London churches: St Bartholomew's (entrance £4/ £3 if in a group). We are grateful to Tom Bogdanowicz for leading this ride.